Welcome to the July 2016 edition of Wildlife Wednesday. The United States marked its 240th birthday on Monday and today we mark the 2nd birthday of this wildlife gardening meme! I appreciate and thank all who’ve participated in Wildlife Wednesday. Each first Wednesday, I’m impressed and inspired by the fabulous photos and compelling anecdotes that avid wildlife gardeners share when they post for the meme. And for those who’ve tuned in each month to read–a big kiss on the cheek for your interest in and love for wildlife. Wildlife gardening is an activity that everyone can take part in. Especially in urban areas, planting for birds, pollinators, and other wild animals helps balance ongoing damage to natural zones and allows our world to heal–if just a little bit–by providing for those who can’t speak for themselves and with whom we share our world. As July sees celebratory parades with accompanying banners and fireworks, I thought I’d host my own parade of critters that I’ve profiled during this past month. So, strike up the band and wave your gardening flags, here are July’s wild things! The garden has been full of Gulf Fritillary (Agraulis vanillae) flitting and feeding this past month. 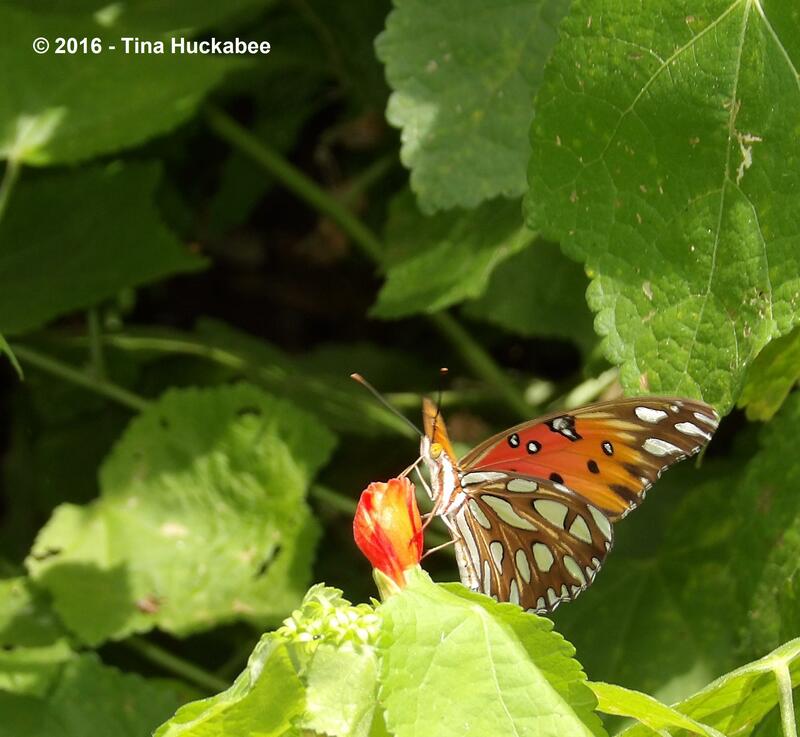 Gulf Fritillary nectaring on a Turk’s cap bloom (Malvaviscus arboreus). Look at that long proboscis. 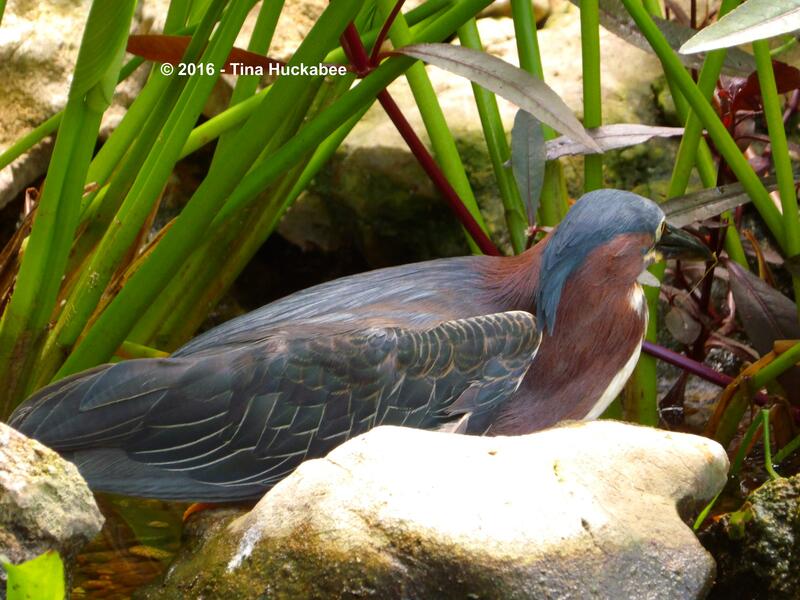 I enjoyed this guy’s visit earlier in the month: Green Heron, Butorides virescens. Standing stalwart, ready to pounce in the bog. 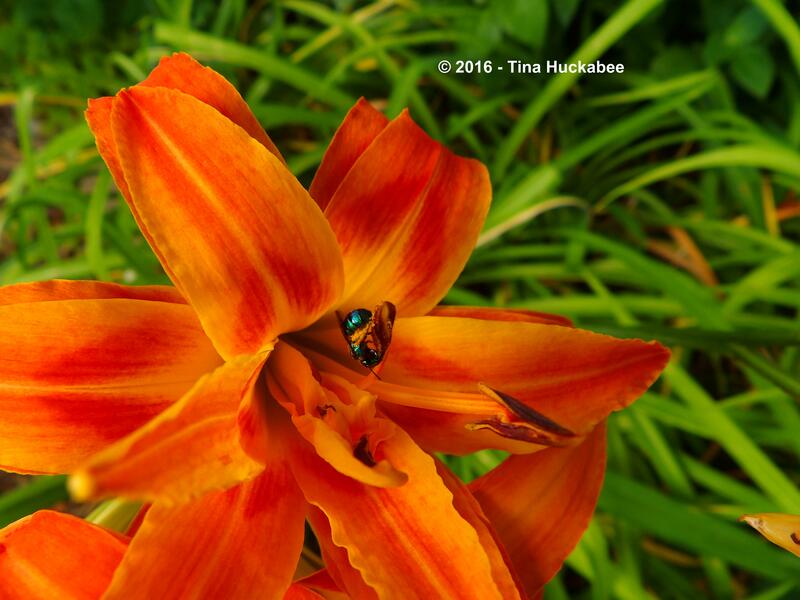 Beautiful metallic native bee enjoying the bounty of a passalong daylily. 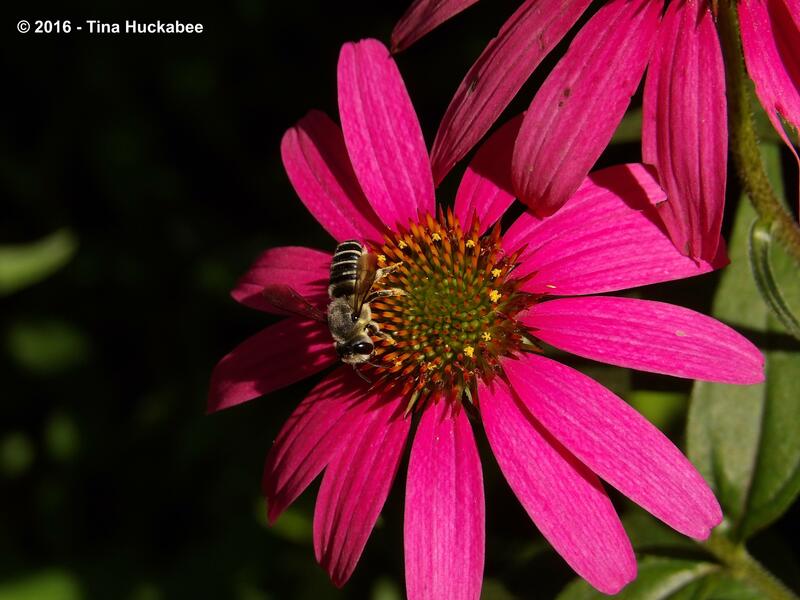 Female leafcutter bee, also a native, gathering pollen for her offspring from a Purple coneflower (Echinacea purpurea). Pipevine Swallowtail (Battus philenor) showing off pretty wings. Soldier beetle (Cantharidae family), one of many pollinators who live and thrive in my garden. As June progressed and summer has settled in for the duration, damsels and dragons zoom around in the garden, landing here and there on pond and plants, adding their special charm to summer’s wild festivities. 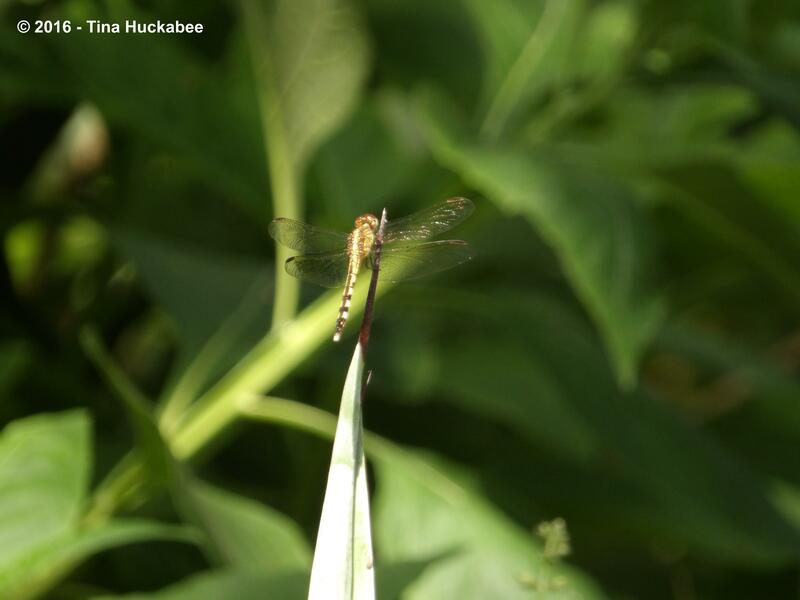 This dreamy (ahem, unclear) shot is, I believe, an Eastern Ringtail, Erpetogomphus designatus. Supposedly common in the Austin area, I’m not sure I’ve enjoyed the privilege of meeting this kind of dragonfly before. According to several sources, the males have a slightly larger “club” at the end of the abdomen, also orange-colored, but this one has neither quality. My guess is that she’s a she. Giving firework colors a run for their money, Neon Skimmers, Libellula croceipennis, grace my garden regularly from June to November and are always welcome. 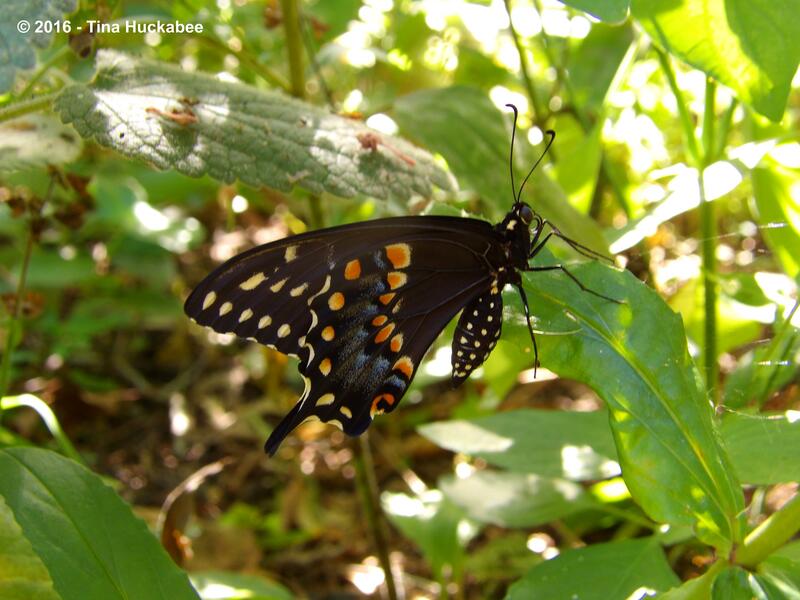 During National Pollinator Week, I profiled the Black Swallowtail, Papilio polyxenes, butterflies who make their nurseries in my garden, but who travel as adults throughout the neighborhood to nectar and mate. In my garden, there are several currently in metamorph stage, attached to stems and hidden from predators. I photographed this winged jewel on the morning of emergence. A newly emerged adult, drying its wings near its former home. Butterfly and moth chrysalises are so well camouflaged that it’s a gift to find them–lucky me this time!! 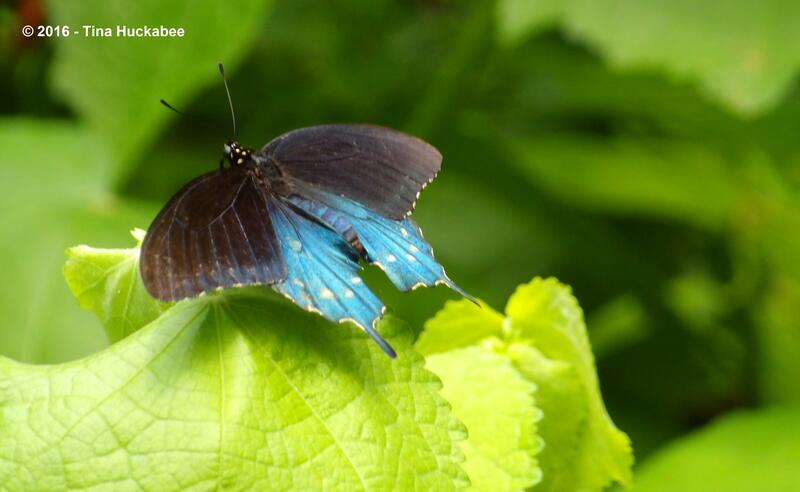 Butterflies are easy to appreciate because of their beauty and daytime winging and nectaring habits. But moths, common at dark and more subtly pattered and colored, also contribute to pollination and play an equally important role in a balanced ecosystem. Like many, my knowledge of moths is woefully inadequate. I can tell you that this is a moth, but haven’t found the exact identification. It reminds me though of a rock climber, sans ropes, hanging on to the rock, before advancing upwards. Spiders are back! I enjoy watching the Black-and-yellow Argiope spiders that are common in Austin gardens, including my own. I was frustrated that I couldn’t get a clear shot of the top, more decorative part of the spider, and then realized that I was quite fortunate to have a clear view of the usually hidden underside of this female argiope. It looks like she’s snagged one of my darling honeybees for a meal. 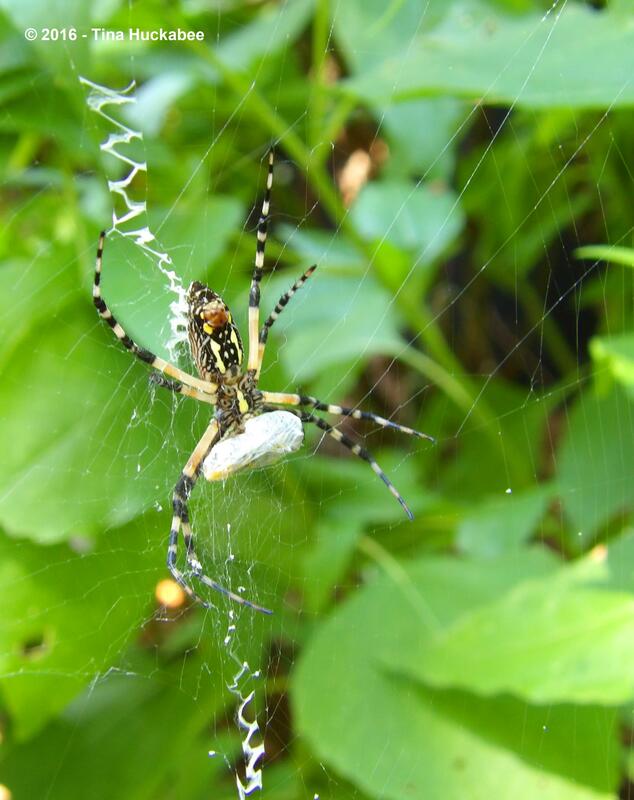 Well, I’m not so crazy about that part of a garden spider, but tolerance of hunting and acceptance of the fate of prey is part of wildlife gardening. Everyone must eat, which usually means that something was alive and no longer is. But these cheeky ones also blush brown when necessary, as camouflage from predators. 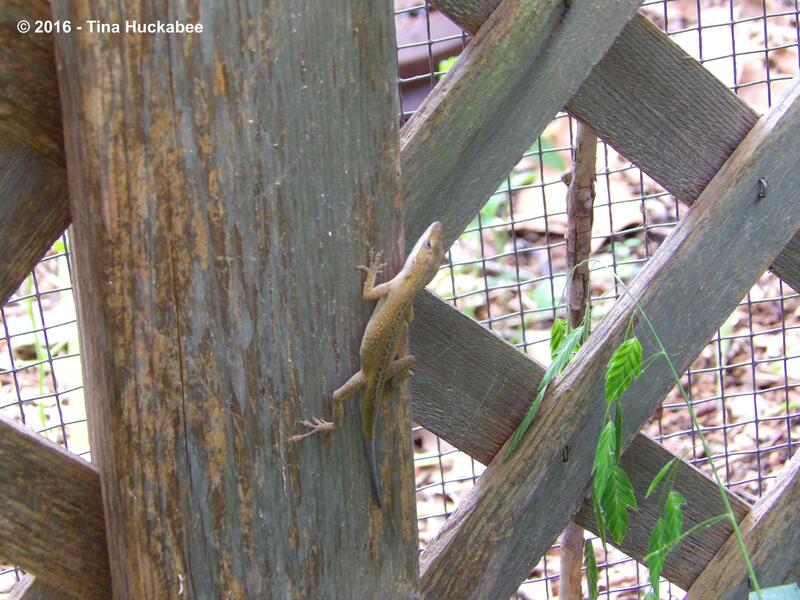 This anole blends in well with the wooden fence. 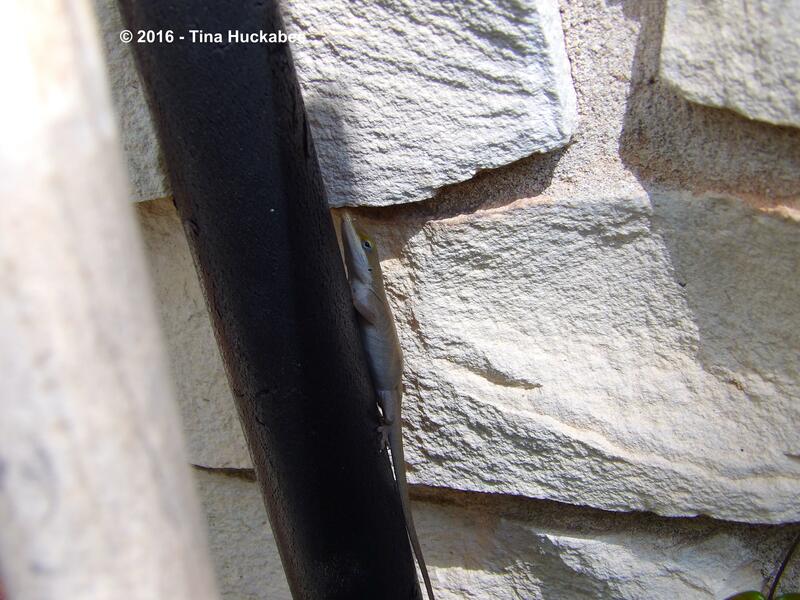 This anole hides with the backdrop of a limestone wall. 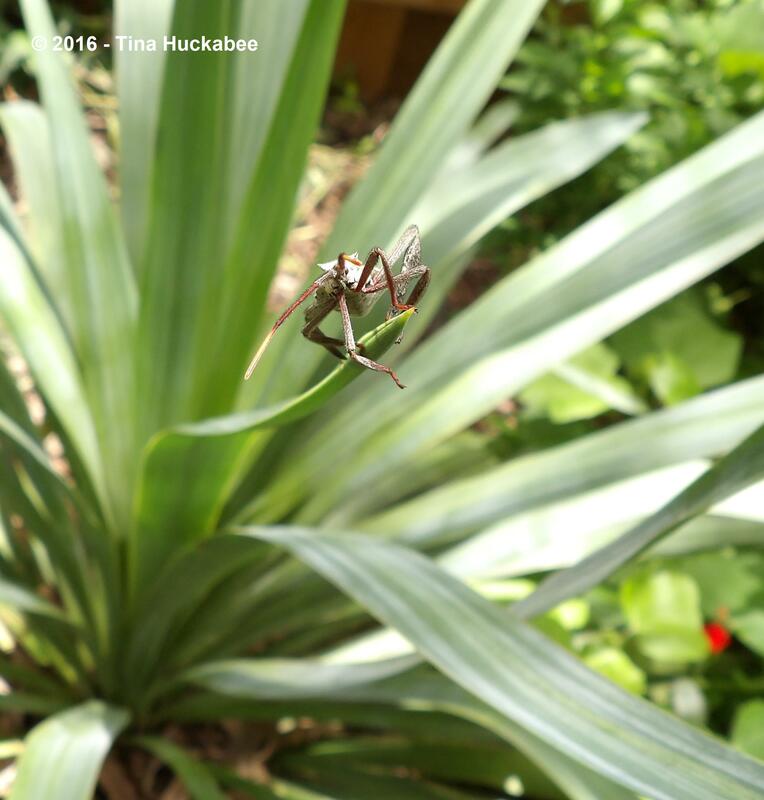 This Leaf-footed bug, Acanthocephala terminalis, practically dared me to catch a photo as it traveled the length of a Soft-leaf yucca leaf, toward this camera-wielding gardener. It looks like he’s dancing a jig as he made it to the end of the leaf. But in the end, I’m bigger, more technologically advanced (sort of…), and higher up on the food chain, so yeah, I was able to catch him/her in a plucky stance. This bug sports decorative feet and antennae. There are a wide variety of Coreidae, or Leaf-footed bugs, in this area and I enjoy seeing them in my garden. They do feed on plants, but I’ve never seen serious foliage damage from them, or at least, none that I’m aware of. I’m sure there are some leaves, less than pristine, which owe their damage to the bugs’ meal preferences, but it’s nothing that I lose sleep over. Keeping abreast of who inhabits and visits your garden will ensure that no serious “pest” damage occurs. Usually, a spritz of water, once or twice, is all that is needed to discourage less-than-welcome marauding insects. Pesticides, even “organic” pesticides are highly damaging to many garden creatures, and not only the ones targeted. 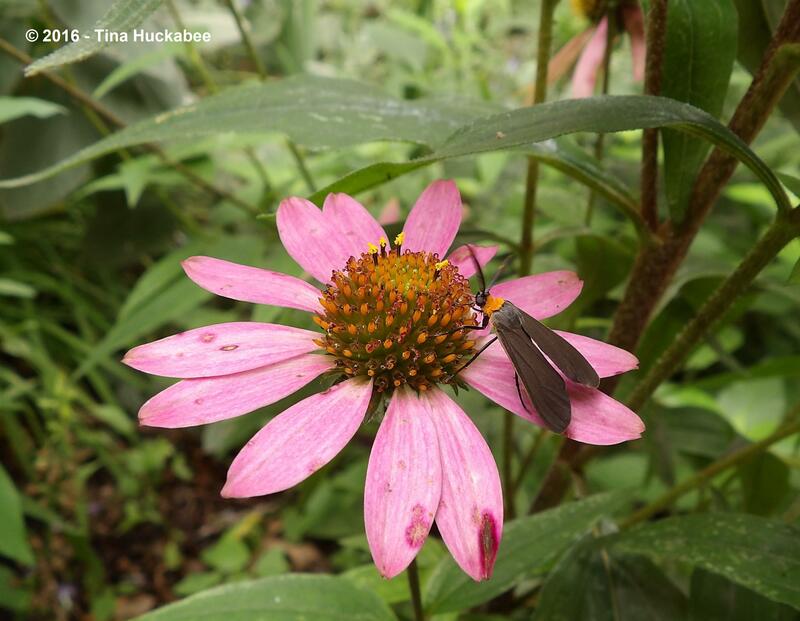 A garden is alive and fulfilling its purpose when it nurtures a wide diversity of critters–insects, spiders, birds, mammals, and reptiles, and chemicals are anathema to a healthy, diverse wildlife community. 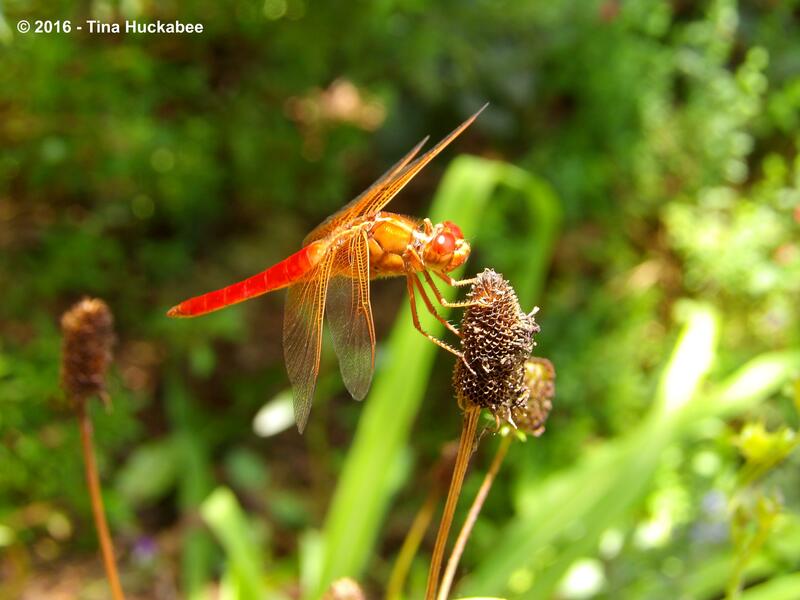 Did wildlife visit your garden this past month? Please post for July Wildlife Wednesday Share the rare or mundane, funny or fascinating, beneficial or harmful critters you encounter. When you comment on my post, please remember to leave a link to your Wildlife Wednesday post so readers can enjoy a variety of garden wildlife observations. 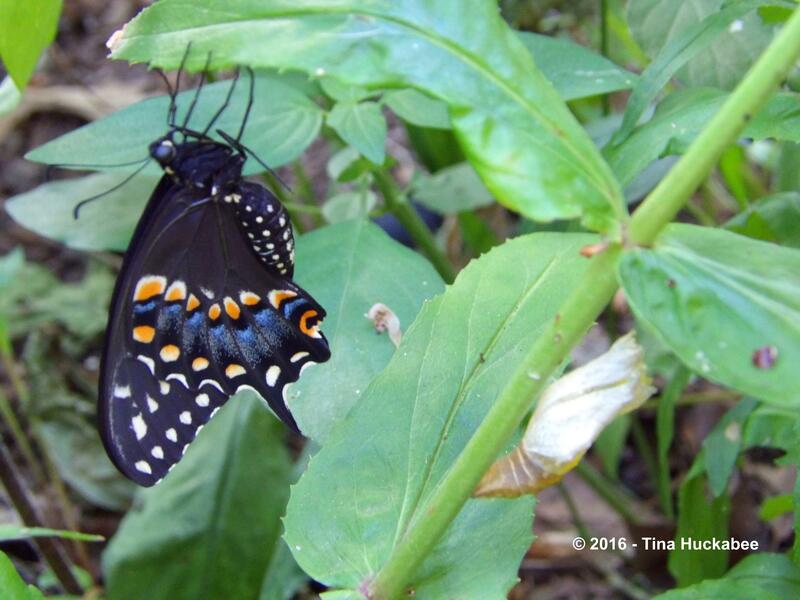 This entry was posted in Eastern Ringtail, Uncategorized, Wildlife Gardening and tagged Black and Yellow garden spider, Black Swallowtail Butterfly, Green Anole lizard, Green Heron, Gulf Fritillary, Leaf-footed bugs, Native Bees, Neon Skimmer, Pipevine Swallowtail, Wildlife Wednesday by Tina. Bookmark the permalink. You’ve captured some stunning images. I love the pipe vine swallow tail, I’ve never seen one of those before and of course the image you showed before of the chrysalis was so clever of you to see when I would have had eyes only for the butterfly. Great shots of the Green Heron. How big is it? Most of the Heron I see around here are very large. The Green isn’t as tall as the Great Blue, which I’ll bet is what you’re seeing. I’ve had Blues visit, but can never get a good photo of them–they’re so shy. This one is generic duck size, I suppose. Well here’s another fine post you’ve shared! It is so hard to pin down a favorite sighting, though my first impulse is to applaud both the chrysalis, because they are ridiculously hard to spot, and the heron, because I don’t see any comparable large feathered fishers in my pond-less garden areas. What I do have on the large side is one particular doe, probably a recently delivered Momma, who has developed a major appetite for Virginia creeper leaves. She appears in the early morning hours and nibbles away…nibbles away. I’m happy to share, under the circumstances. Moving from large to small, I’ll second the Gulf Fritillaries Everywhere! notion. I’m seeing Hairstreaks aplenty, and occasionally we host a squadron of hovering dragonflies, but we aren’t seeing many Skippers this year. The loveliest sighting has been a solitary Southern Pink, nestled becomingly, showing off a tiny flash of contrasting color against the blue ranges of a Henry Duelberg Salvia. Thanks from the bottom of this gardener’s heart for hosting the meme, such a wonderful way to share the joys of gardening for the Wild Ones. Happy Wildlife Wednesday! Gosh, Deb, you’re welcome–you’ve been such a great supporter from the get-go, so thanks to you. The chrysalis was dumb-luck. I was crawling around and there it was–they are hard to spot, indeed! Yes, I’m also awash in Gulf Fritillaries and tons of Grey Hairstreaks this year–no complaints! I’ve also seen several Southern Pinks–such little cuties, I need to grab the camera for that one (or, how ever many). Congrats on the baby deer–I guess? Those babies are just the cutest things, but I know what they do to gardens…. 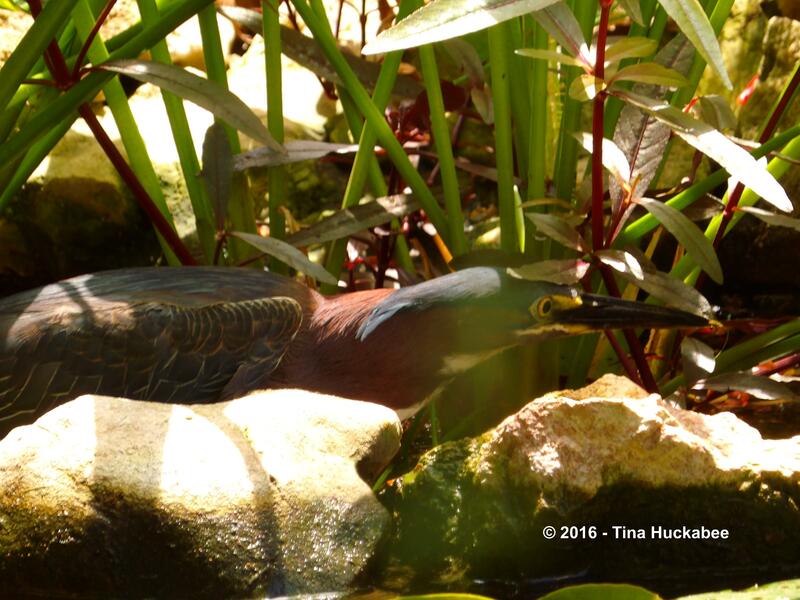 Wow Tina most impressive especially to have the green heron visiting…what a joy that would be if I saw one here. And butterflies. I spied about 3 this year but none wanting to stop long enough for a picture. With our weather and the increase in spraying chemicals with my neighbors, there is less and less wildlife of all kinds here, especially butterflies. Yes, the Green Heron was fun to see. So very sorry that you have neighbors spraying–I don’t know what it takes to educate folks that spewing poisons really isn’t the answer. But…I’m very sorry that you’re short of butterflies–so sad. They want to get rid of mosquitoes, bees (yes bees) that are building nests in their siding….because they have only grass and lots of stone mulch around shrubs so the bees have no other spaces….and they spray for weeds and green lawns. Has my husband says….’kill everything’ is their motto! Oh dear. I’m sorry you’re living near to that, but it’s certainly true here that those who like the sterile outdoor look also use chemicals with abandon–both practices go hand-in-hand. Yes, I’d agree with your husband and add my own: Better living through chemicals. Butterfly activity is picking up in our garden, though I have yet to see a pipevine swallowtail. Too bad about your bee in the spider web, but it’s a great picture…and yes, everything has to eat. There’s a dragonfly or two in my post today that are dinner for some hungry Purple Martin babies. 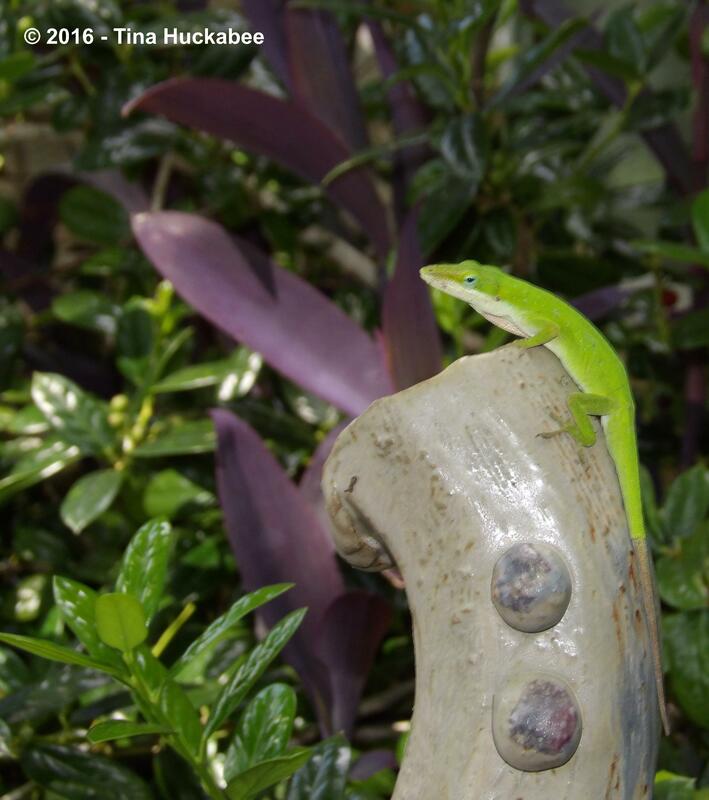 Thanks for hosting this meme, Tina, it’s always fun to see the wildlife in everyone’s garden. 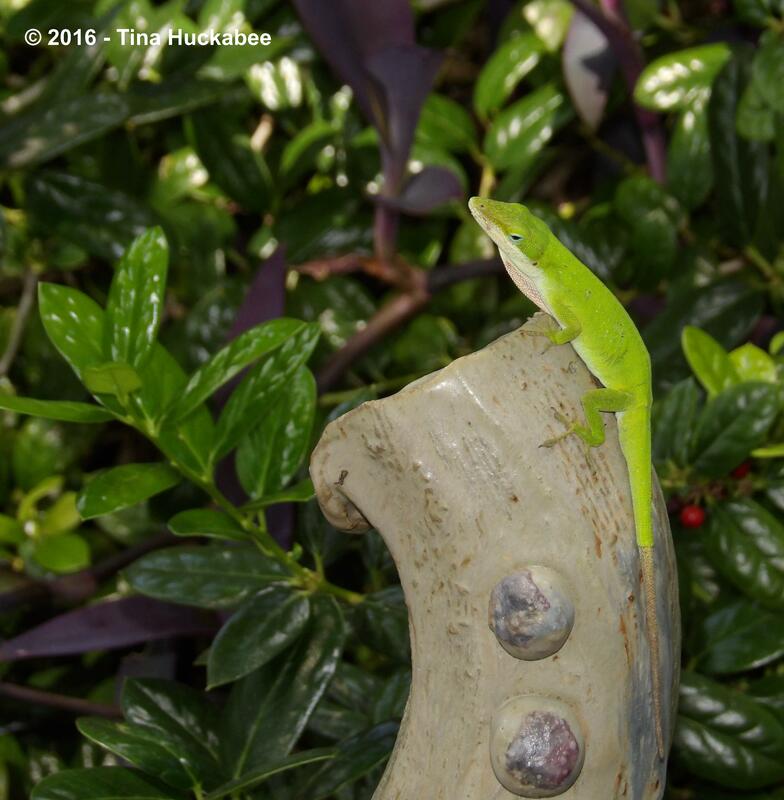 Thank you, Tracy–I enjoy seeing what folks have in their gardens, too. Usually, I enjoy more butterflies as summer progresses into fall, than during the spring. I was in such a hurry yesterday, I forgot to post a link to my Wildlife Wednesday post. Amazing critter photos! I often wonder how many chrysalises and cocoons are in the garden right under my nose as I’m moving about. 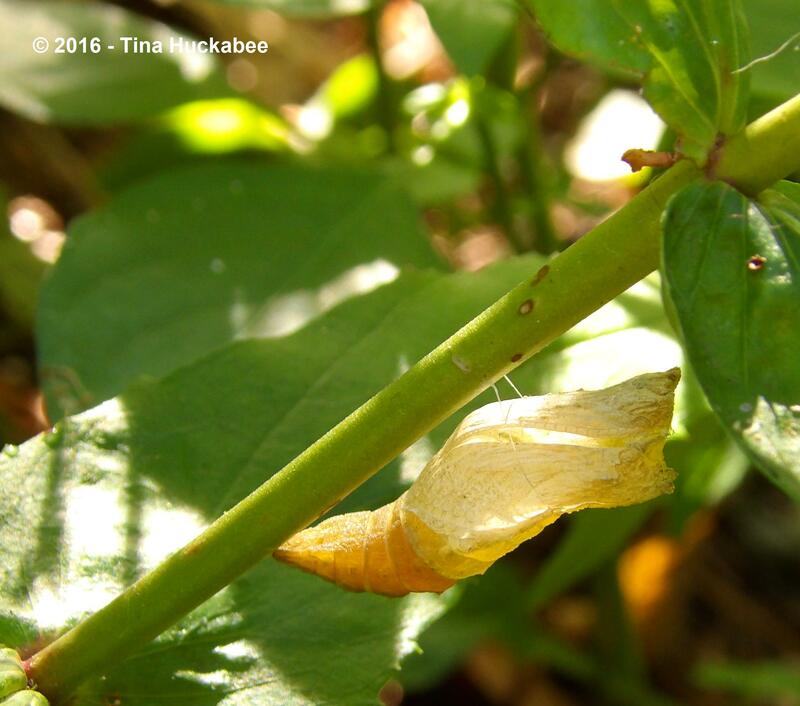 You are lucky to find that newly emerged Swallowtail next to its chrysalis. I am going to try to be better about participating in this meme, because I enjoy it so much! Thanks, Beth. I’m sure there are plenty of chrysalises out there that we miss–I feel fortunate when I find one. I hope you participate with your lovely text and gorgeous photos–see you next month?! Oh I love the leaf-footed bug. How entertaining. I’ve included some damsels in my post too, but I would really love to see a neon skimmer. Well done on two years! Thanks for your good wishes–it’s been fun. 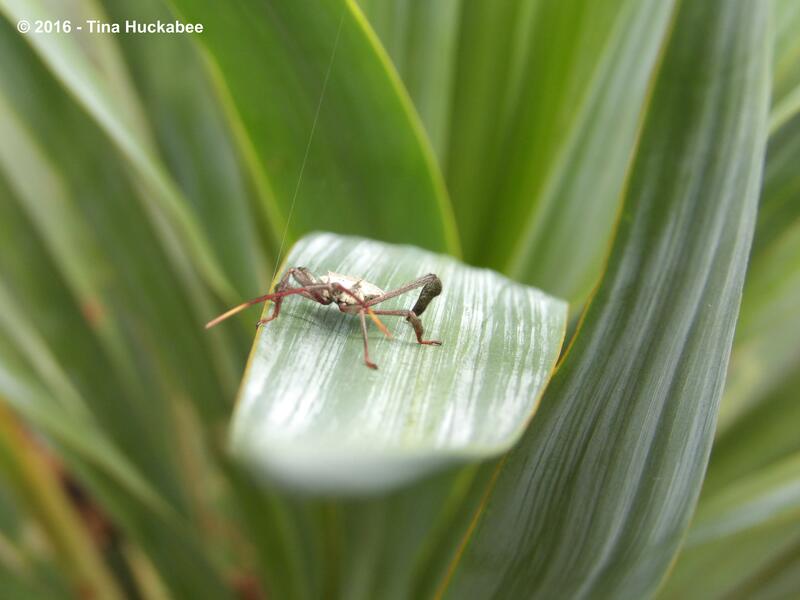 Isn’t that leaf-footed bug a character. I love those bugs, they’re always fun to watch. Neon skimmers really brighten the garden–there are two pairs in my garden, I hope the pond is big enough for both!! Oh that Pipevine Swallowtail is such a beauty. I’m adding some plants to try and attract them this year. 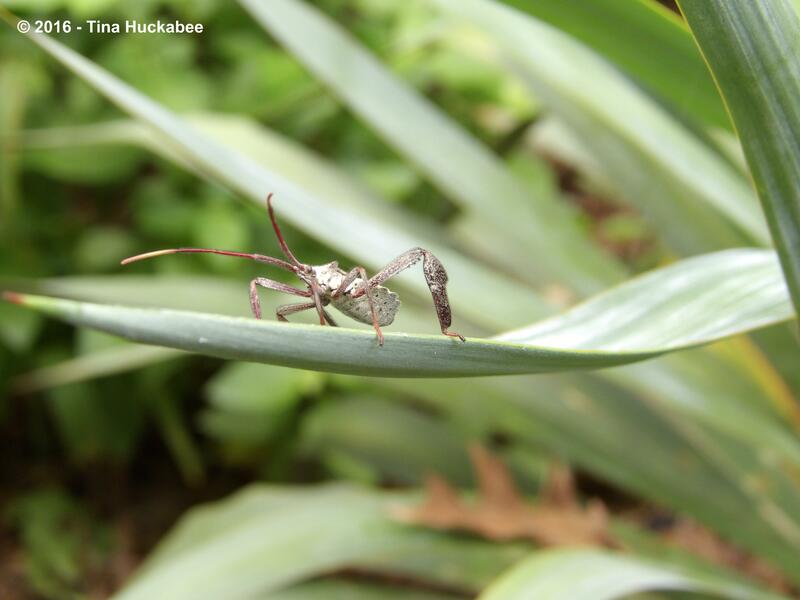 The leaf-footed bug story is cute. Thank you for two years of nudging to get out there and look closer at my garden. Isn’t’ it gorgeous? In the past, I’d see one occasionally, but this year, at least one is always around–nice!! And you’re welcome! I imagine that you don’t need lots of encouragement to get out into your garden and see what’s there, but I’m glad you’ve enjoyed the meme! We have PLENTY of sunshine, that’s for sure!! And, it’s quite hot now, so that also goes along with the sunshine. The pipevines have been real jewels this summer–I’ve enjoyed seeing them. I’m so glad you chip in each month–thanks for making this a fun meme. I’m an apartment dweller and don’t have a garden, but I do get out and about quite a bit, and was delighted to see several familiar friends: the anole, the argiope, the black swallowtail, the leaf-footed bug. 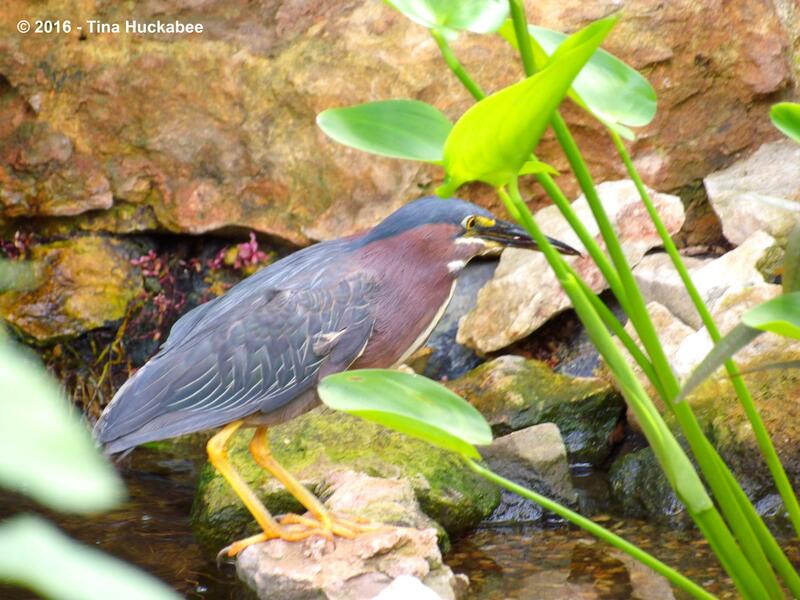 Since I’m on the coast (near Galveston), the green heron is very common — sort of a marine starling — and so are the dragonflies and damselflies. I’m not very good at identifying those, but I do believe I have a photo of a Cherokee dancer now. More checking is required! I so enjoyed your photos: a lovely mix of familiar and unfamiliar. I’m sure you’re able to see Green Herons–I love that description, “marine starling”! I agree that the dragons, and especially, the damsels are tricky to ID. I have a number right now in the garden, probably females, and they’re so similar. Thanks so much for reading! Thanks!! I like that moth, too. I’m frustrated that I can’t figure out what he/she is. 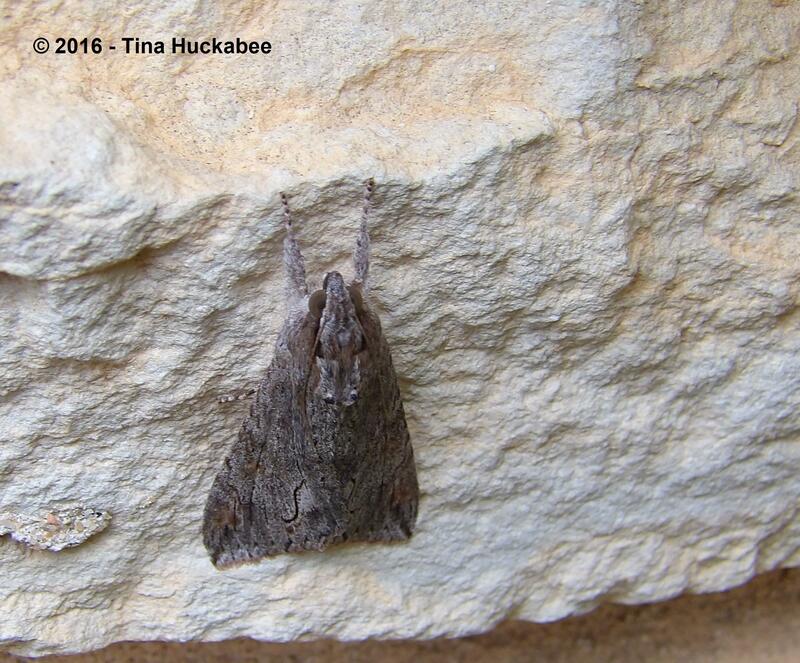 I’m fairly sure it’s in the owlet moth family, but it’s unclear to me after that. It’s probably some horrid invasive. Still, I liked it’s Zen-like pose. Beautiful photos of a lovely place, nice to see so many butterflies and insects. I’m glad they’ve made their homes in my garden! Thanks, Sue. The lizard and heron have been big hits this month. 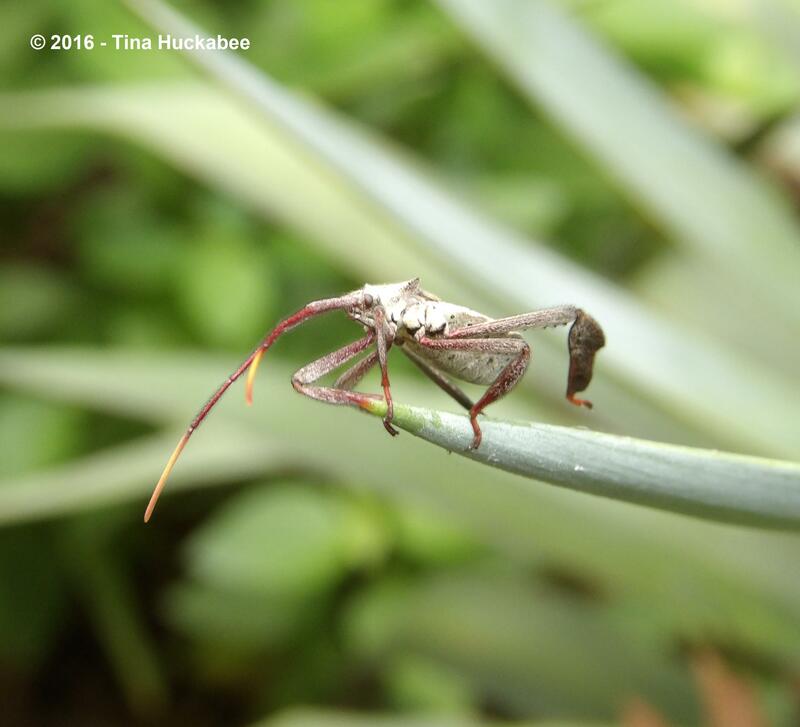 I’m very fond of the leaf-footed bugs, even thought *technically* , they’re not beneficials. They’re just so cheeky and seem to show such personality. 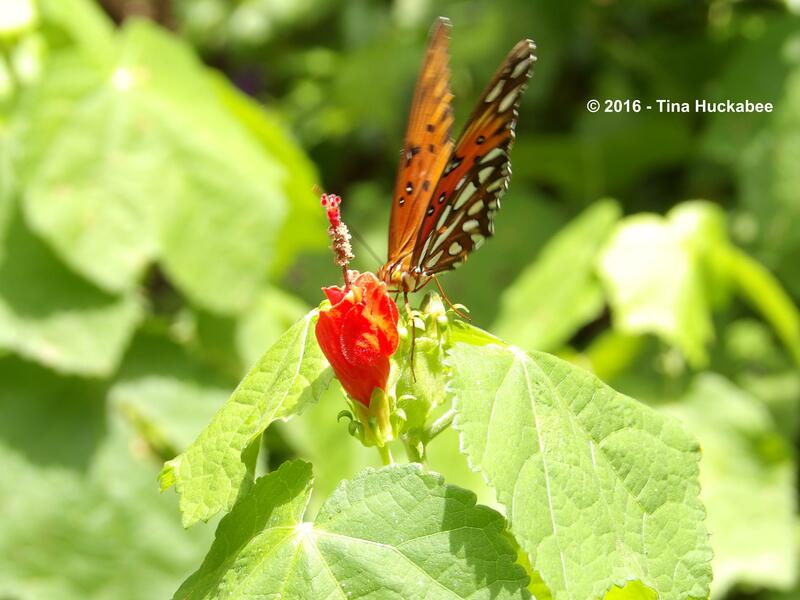 Great photographs all, but I especially love the Gulf Fritillary and Pipevine Swallowtail. I am growing some Dutchman’s Pipe Vine in hopes of attracting Pipevine Swallowtails to our garden. Thanks, Jason. Good luck in attracting the Swallowtails. I have two neighbors growing two different varieties of Dutchman’s pipe–thus the Pipevine swallowtails. Tina las fotografías son maravillosas y sus protagonistas preciosos. Precisamente la noche del 8 de Julio había un escarabajo con cuernos muy grandes sobre mis zapatillas. Le cogí con un poco de papel y le dejé con todo cuidado en el jardín. Tina no le hice ninguna foto porque acababa de llegar a la casa de campo con mis Padres desde el piso de Madrid, la capital de España, y era muy tarde y estaba muy cansada. Este año no hemos venido antes a la casa de campo porque mi Padre ha estado muy enfermo y volveremos a Madrid pronto para que mi Padre vuelva a ver a los doctores. Tina disculpe por contarle esto. Me ha encantado su desfile, en especial la Garza y la Lagartija. Gracias. Saludos de Margarita. I’m glad you enjoyed the post, Margarita. Perhaps next time, you’ll be able to get a photo of the beetle that you saw. I wish your father a speedy recovery. The leaf footed dude made quite a mess in a stand of my sunflowers last year, so HA! I didnt plant any this year. Maybe his ancestors will move down the street! Oh, well that’s a real bummer!! I’ve never seen serious damage, but a flock of them could cause havoc, I’m sure! 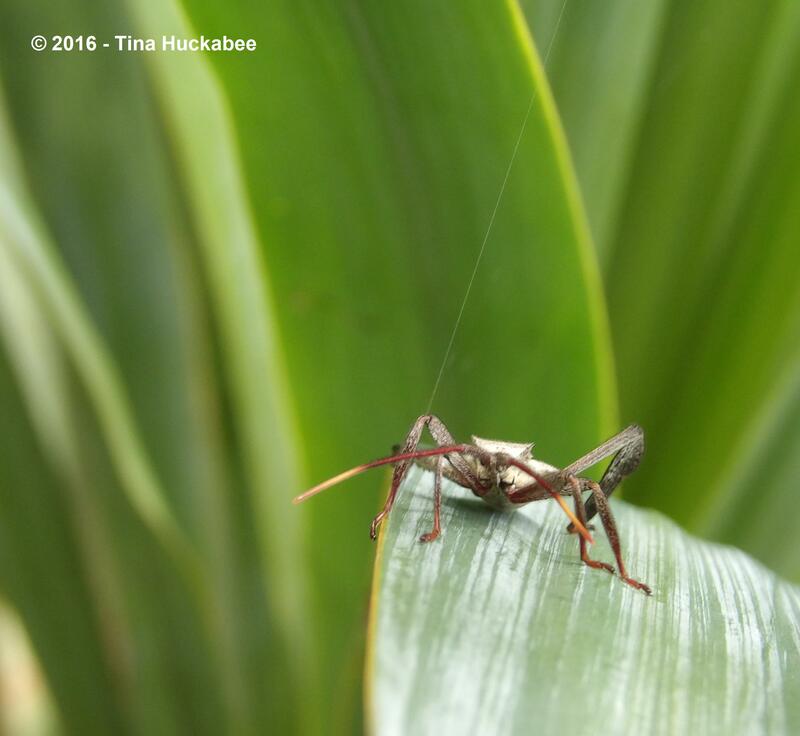 That leaf-footed bug-person is very cute. I also love the gulf fritillary, but all your photos and their plants and visitors, are quite lovely. I’m sorry, Tina, I seem to have missed this post til now. Very difficult to find out what the moth is – there are so many that are very like each other. The only thing I’d say is if it was large then it’ll have been a hawk moth of some kind. Gorgeous pictures and I also love the way you weave information throughout the post! I once saw a moth emerge from its cocoon (because I had kept the cocoon in a jar in the house), but I have never seen a butterfly emerge! That would be a special treat and I’m glad you got to see it. Thank, Ms. Tex! It’s tricky, finding these cocoons and keeping an eye out–all about patience, perseverance and a healthy dose of good timing. Wonderful post as always! I think what you say about healing the world even just a little can’t be said often enough. People love to go on grand adventures to the National Parks but nature and wildlife exists everywhere. Knowing the plants and animals in your immediate vicinity I would argue is of infinite value. We recently drove through your part of town on an errand and I did say to my husband: How on earth are Tina’s neighbours not inspired to grow flowers!